Division update 1.7 will be available for download on August 15. However, the official details about the update are now available. According to the Division update 1.7 patch note, the patch will introduce modifiers that will affect all PvE areas (including DLC), providing a stiffer challenge, and offering powerful rewards. Each Global Event will be themed, and the first one, Outbreak, will be tied to the pandemic that brought the city to its knees. Additionally, new Activity modifiers can be activated on specific missions and Incursions, stacking on top of the Global Event modifier and providing a new difficulty layer to test your tactics and teamwork. With Division update 1.7, the existing gear sets are being revamped and upgraded to Classified Gear sets, which carry new five- and six-piece bonuses, bigger primary stat roles, and additional recalibration options. Secondly, a new cosmetic customization slot will let you up your intimidation factor with face masks. You’ll also be able to update your look at the barbershop by swapping out your sunglasses or getting a fresh cut. New Encrypted Caches with exclusive emotes, outfits, and skins will be unlockable with cypher keys that can be purchased with premium credits, or assembled from key fragments, which you can collect by completing commendations (see below) or killing named bosses throughout the game. Finally, the Division Update 1.7 will add a new kind of challenge to help you show off your achievements in difficult tasks. Commendations will reward players with new arm patches for doing things like killing 100 enemies with a shotgun, finishing Napalm Production Site on Legendary Mode, and activating all 63 ECHO scenes (if you’ve already completed one of these tasks, you’ll get commendation credit for it). Taking part in a Global Event will award you Tokens that you can use to purchase Classified Gear caches (detailed below) and unique vanity items (that are currently not included on the PTS). With Division update 1.7 for PS4, Xbox One and PC, Unlocking achievements reward the player with Commendation Score. Your tallied score is displayed to other agents. With Division 1.7 for PS4, Xbox One and PC, Unique appearance items from the Encrypted Caches are organized in Collections that can be found in the Vanity tab. Once a Collection has been completed, the agent will receive a reward. With Division update 1.7 for PS4, Xbox One and PC, Classified Gear Set pieces are unique gear set pieces for pre-existing gear sets and will feature 5 and 6-piece bonuses. When a weapon has 50% of its magazine remaining, there is a 75% chance to receive a bonus that activates when the final bullet is fired from the current magazine. Once activated, the magazine is instantly refilled, weapon damage is increased by 20%, fire rate is increased by 20%, and stability and accuracy are decreased to 0. The bonus is cancelled by reloading or exiting combat. -HE/Incendiary: Weapon damage increased by 20% for 8 seconds. -Flashbang/Tear Gas: Damage Mitigation increased by 20% for 8 seconds. With Division update 1.7 for PS4, Xbox One and PC, Blueprints are now shared across all characters on a same account. The Division 1.7 update for PS4, Xbox One and PC has fixed a bug where players receiving a burn status effect right after throwing a grenade or throwable skill would disable the grenade or skill. The Division update 1.7 for PS4, Xbox One and PC has fixed a bug where players could run faster than they should by spamming the sprint button. The Division 1.7 update for PS4, Xbox One and PC has added a hard cap on RPM for all weapons. It will no longer be possible to overcome the RPM limitation of a weapon, no matter what shooting method is used. The Division update 1.7 for PS4, Xbox One and PC has fixed a bug with Banshee where ammo would not refill correctly after going Rogue. The Division update 1.7 for PS4, Xbox One and PC has fixed a bug where Talented would proc when killing an enemy with a skill or grenade instead of the weapon itself. Minor color tweaks have been made to make the Loadout UI more consistent. 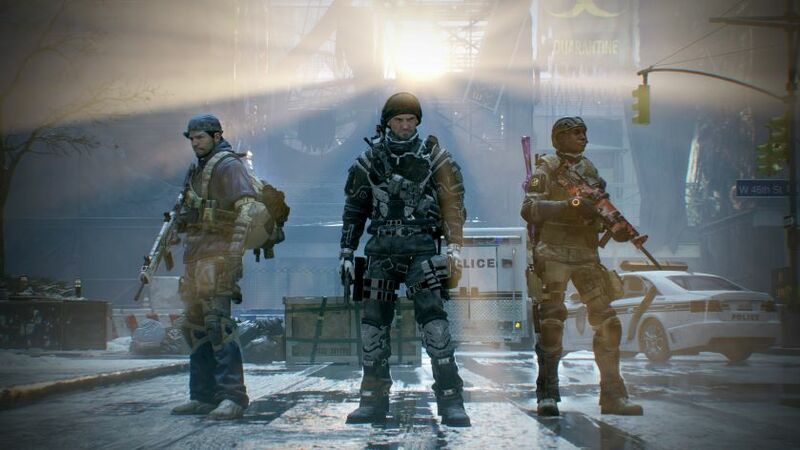 The Division 1.7 update for PS4, Xbox One and PC has fixed an issue where a player cannot switch between two identical Loadouts using different mods while having a full backpack. The Division 1.7 update for PS4, Xbox One and PC has fixed an issue where the Pulse icon would overlap other UI elements. The Division update 1.7 for PS4, Xbox One and PC has fixed a bug where the Seeker Mine with Cluster mod would sometimes be unable to detonate on a target if the target was on top of a cover. The Division 1.7 update for PS4, Xbox One and PC has fixed a bug where if an agent revived by another skill while in a Support Station’s area of effect would cause the Support Station to despawn. The Division 1.7 update for PS4, Xbox One and PC has fixed a bug where an agent would get revived if the agent was in the process of self-reviving from a friendly Support Station but tried to cancel the action. The Division update 1.7 for PS4, Xbox One and PC has fixed a bug with First Aid Defibrillator where a player equipped with a Vigorous chest rolling into the area would only receive the instant heal and not the heal over time. The Division 1.7 update for PS4, Xbox One and PC has fixed a bug where the Mobile Cover could be knocked down by other agents and enemy NPCs even though they were under immobilizing status effects. The Division 1.7 update for PS4, Xbox One and PC has fixed a bug in Napalm Production Site where an agent could defeat Joe Ferro inside his room before defeating his guards. The Division update 1.7 for PS4, Xbox One and PC has fixed a bug in Grand Central Station where the turrets were reactivated after player death. The Division 1.7 update for PS4, Xbox One and PC has fixed a weird door in the General Assembly parking lot. The Division 1.7 update for PS4, Xbox One and PC has fixed an issue with the Mad Skills Directive where the second skill would go on cooldown when the player aimed his first one. The Division update 1.7 for PS4, Xbox One and PC has fixed an issue where enemies were unable to detect the player after going through a weird fire door. Fixed a bug where the Punisher accolade on the end screen would always have a checkbox next to it even if it wasn’t completed. The Division 1.7 update for PS4, Xbox One and PC has fixed instances of the game freezing when leaving Survival. Fixed a bug where Mods could not be equipped on items in Survival. The Division 1.7 update for PS4, Xbox One and PC has fixed a bug where the Base of Operation would become unusable after visiting the Premium Vendor. The Division update 1.7 for PS4, Xbox One and PC has fixed an issue where a Named NPC was missing from the The Basement landmark in DZ09. The Division 1.7 update for PS4, Xbox One and PC has fixed a bug where enemies would stop engaging the player if they hid behind certain objects in the Q Building Landmark. The Division 1.7 update for PS4, Xbox One and PC has fixed a bug where pressing back while having the option to disable sharing for an item would cause the item to be unshareable. The Division update 1.7 for PS4, Xbox One and PC has fixed a bug where you would get the wrong message when buying an item from any vendor. Players now get a warning if their wallet is full of a given currency and they open a Cache containing that currency. The Division 1.7 update for PS4, Xbox One and PC has fixed an issue where an agent would right-click on an item and the text describing the options presented would flicker rapidly. The Division update 1.7 for PS4, Xbox One and PC has fixed an issue where agents could still use the scroll wheel while the Not Enough Space prompt was present. The Division 1.7 update for PS4, Xbox One and PC has fixed an issue where the player’s FPS would still be capped despite turning off the Frame Rate limiter. The Division 1.7 update for PS4, Xbox One and PC has added sound effects to the JTF officer knocking on bars in the Brooklyn Precinct. Maybe someone will actually hear him and help him out now. The Division 1.7 update for PS4, Xbox One and PC has fixed a bug where players equipped with 6-piece Lone Star would sometimes no longer deal damage after the Berserker Talent triggered. The Division update 1.7 for PS4, Xbox One and PC has fixed a bug where Global Event progress performed in Manhattan would reset each time a player would play a session of Underground, Survival or Last Stand. The Division 1.7 update for PS4, Xbox One and PC has fixed a bug where some Incursions bosses would not drop any Global Event Tokens. The Division update 1.7 for PS4, Xbox One and PC has fixed a bug where some Open World bosses would not drop any Global Event Tokens. The Division update 1.7 for PS4, Xbox One and PC has fixed various Commendations not updating correctly. The Division 1.7 update for PS4, Xbox One and PC fixed an issue where the Ninja Backpack bonus would not apply correctly when equipping it. Check your game update and download the Division Update 1.7 for PS4, Xbox One, and PC.